In 2005, The Chance Theatre brought me back to direct a third production in a row. This was the fiftieth anniversary of the stage adaptation of Anne Frank’s diary. It was an honor to direct this important and compelling story. We used the 1997 adaptation (created for the Broadway production with Natalie Portman), which is much tighter, more specific, and more theatrical than the original 1950s version. And the talented cast and design team brought wonderful ideas to the table; this was a surprising and very moving production that opened up the script with strong theatrical choices and intensely personal moments. 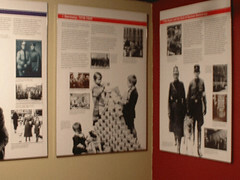 The Anne Frank Story, a seventeen-panel photographic and text exhibit from the Anne Frank Center in New York, was on display in the lobby. "Costello has captured the exact poetic tone, mood, and ambiance needed to underscore the drama..."
"director Josh Costello has wrought an organic production whose every facet fits the larger mosaic, forming a harsh, wrenching, bittersweet tale"